Prue is looking after her brother Mac when the toddler is suddenly picked up by a flock of crows, which fly off with him towards Wildwood, on the edge of Portland, Oregon. Prue heads after him, joined by her nosey friend Curtis. Curtis promptly gets lost in the woods, but Prue can’t spend too much time worrying about that, especially when she is picked up by a shotgun-wielding postman and taken to a palace full of talking beasts. There she learns how she should never have been able to cross over from the rainy normal world into this odd, odd realm. Magic should have protected the place from Outsiders like Prue and Curtis, ensuring anyone who wandered in would always walk straight back out again – even if they didn’t realise they had turned around – and enabling Wildwood’s inhabitants to live side by side with a town full of non-magical Americans. Prue is viewed with plenty of suspicion for having been able to unwittingly ignore this protective magic, and when she receives a warning message from the leader of the man-sized talking owls, she makes a run for it. The story starts off a bit like the film Labyrinth, but quickly develops a distinct Narnian flavour. Curtis reminded me very much of Edmund when he falls under the sway of a mysterious woman who commands an army of armoured talking coyotes. The book is definitely darker than any of the Narnia books (even The Last Battle), however – Curtis doesn’t know it, but that woman once reanimated the soul of her dead son in a wooden toy version of him that contained only his teeth, and her latest scheme is even more diabolical. 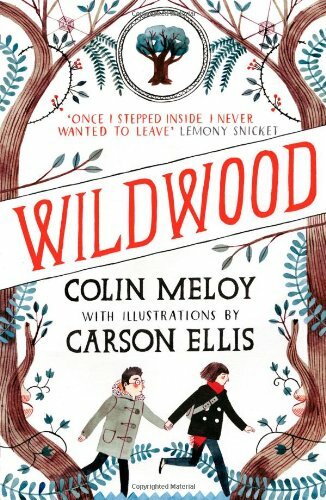 The world Colin Meloy has created has a timeless feel to it, but with apparently anachronistic little details to remind us this is simply a more magical version of the modern day. Wildwood is an epic, slightly episodic novel, maybe a little self-indulgent in places, but it is also a busy story with lots going on and a large cast of distinctive characters, all well developed regardless of how small a role they play. It touches on politics, bureaucracy, nationalism and war, all with a fantastical (sometimes even bonkers) twist, but it did make me wonder if it had been written consciously with the crossover market in mind. Whilst superficially it’s just a great fantasy adventure, there’s a lot more going on beneath the surface that I think would go over the heads of many kids.